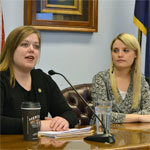 Anchorage – Among the pre-filed bills announced today is "Erin’s Law" offered by Rep. Geran Tarr (D-Anchorage). "Erin’s Law" is a proven, straightforward approach to addressing one of Alaska’s most insidious social ills – child sexual abuse. "Erin’s Law" would require school districts to present students with age-appropriate curriculum about personal body safety. It would also give teachers, staff, and administrators the tools they need to respond properly to allegations of child sexual abuse. "I chose to prefile "Erin’s Law" so that we could get to work immediately and pass this legislation early in session," said Rep. Tarr. "This an opportunity to address a pressing Alaska problem at low cost. It’s also an opportunity to demonstrate that the Alaska Legislature can get important work done even when we are faced with budget challenges." "Erin’s Law" was widely supported last year when Rep. Tarr brought Erin Merryn, for whom the bill is named, to visit the Legislature. "From my visit to Alaska last year, I know there is broad bipartisan support for Erin’s Law," said Erin Merryn, a survivor of child sexual abuse and the main proponent of "Erin’s Law". "I’m hopeful the Alaska Legislature will act quickly to pass this law so students get the important information they need to stay safe." "Erin’s Law" offers a low or no cost way to reduce a devastating social ill. In addition, if cases of child sexual abuse can be reduced, additional costs of providing social services to the victims can also be reduced. In Alaska, there were more than 2,000 allegations of child sexual abuse in 2013. "We teach kids what to do if there is a fire, an earthquake, or another emergency," said Rep. Tarr. "However, we must face the reality that more of these students will be harmed by sexual abuse than by these other threats." "Erin’s Law" has been passed by nineteen states and Rep. Tarr believes it’s time to add Alaska to the list of states taking action to prevent child sexual abuse. For more information contact Rep. Geran Tarr at (907) 360-4047.